If you’re planning to buy chocolates and flowers for Valentine’s Day this Sunday, why not add books to the list? 14th February is also International Book Giving Day when the aim is to get books into the hands of as many children as possible, especially those who wouldn’t normally have them. Most children in developing countries do not own books, nor do one-third of children in the UK, so follow the link to find out how you can help. One of the earliest GLTUs was to Glasgow Women’s Library. Now we can repay the Library by helping with its campaign to have the Suffragette Oak made European Tree of the Year! The oak, on Glasgow’s Kelvin Way, was planted by suffrage organisations on 20 April 1918 to commemorate the granting of votes to women. Last year it became Scotland’s Tree of the Year, and voting for the European round is open throughout February. Vote for the Oak! “My Library By Right” – have you signed yet? If you haven’t signed CILIP’s petition against library closures, now would be a great time to do so! It currently has almost 8000 signatories but needs many more. 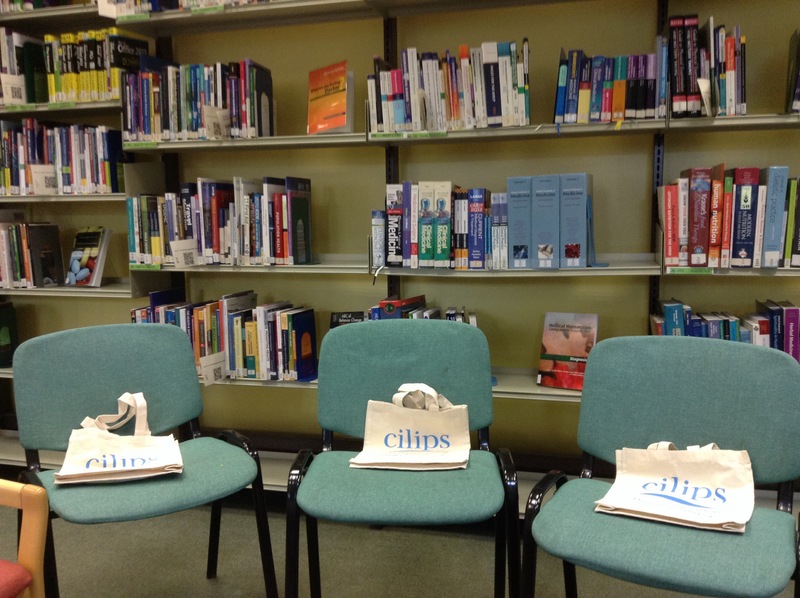 More info on the CILIP website. Thanks to Christine Glasgow (@glasg0wg1rl) for her report of this fascinating visit. Yes, library tweeters, I couldn’t resist a cheesy medical pun to lead us into a description of the excellent GLTU visit to the libraries at Gartnavel which took place on Tuesday the 28th April 2015. I had thought about using “a book a day keeps the doctor away”, but as you’ll soon discover, thanks to the excellent services provided by Shona McQuistan and her colleagues, it doesn’t keep them away—it draws them to the library! And not just doctors, but nurses, students, child play experts, community health visitors, canteen staff and numerous other stakeholders use these libraries on a regular basis. 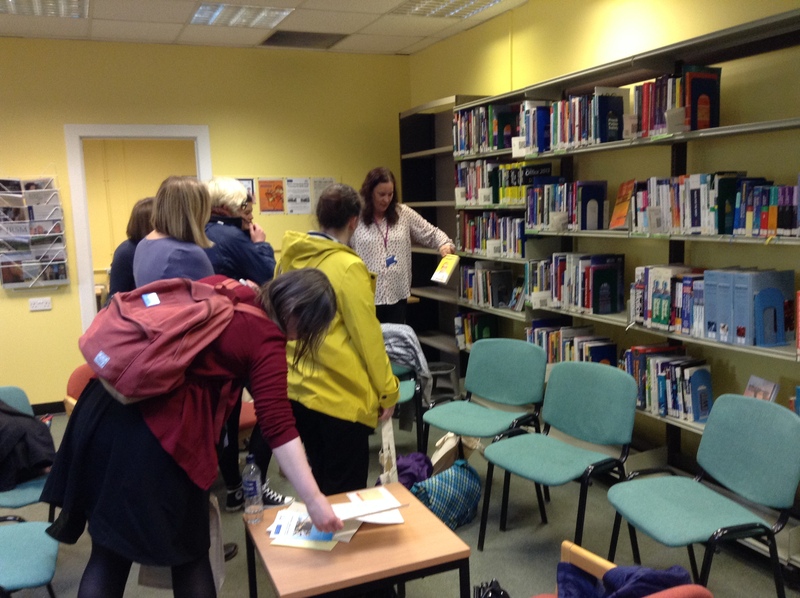 On the 28th April, the user group widened further to include 10 or so librarians from a variety of sectors, all eager to learn more about health libraries with #GLTU15. Shona began by explaining the structure of NHS Greater Glasgow & Clyde Library Network and her role within that as Library Hub Manager (West). Shona manages (what was) the library at the Western Infirmary as well as the library at Gartnavel General, and during the afternoon we visited 3 other information services on the hospital campus, including those at the Beatson, the Public Health Resource Unit and Gartnavel Royal. It was clear from the outset that Shona and her staff have a real passion for their work and that the libraries are a huge part of the hospital community. The library at Gartnavel General in particular has a very warm, welcoming feel, similar to a public library, and many of us were surprised to see a large selection of fiction books on display, alongside popular self-help and fitness titles and language learning and literacy materials as well as the expected medical textbooks. Shona then explained that due to the shift patterns worked by many hospital staff, they may struggle to find time to visit their local public library, whereas the hospital library is right on their doorstep. 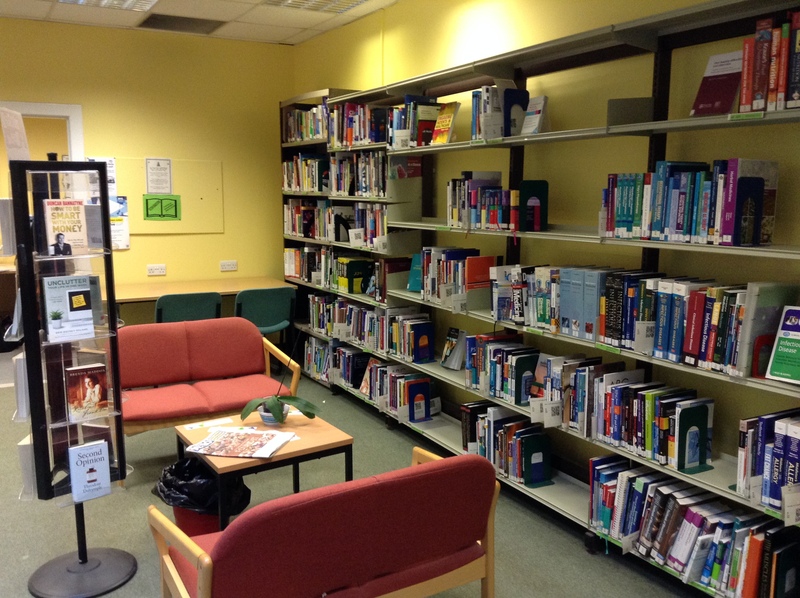 The library at Gartnavel General is a neutral area where staff can get information on a variety of personal development areas such as quitting smoking or coping with change at work. Shona and her staff also run a literacy and numeracy project as well as IT classes for staff who did not have the opportunity to gain these skills at school. This includes outreach to staff in other locations, such as the laundries in Hillington, and staff are encouraged to take part in the Reading Agency’s “Six Book Challenge”. Many staff have already taken part and gained a sense of achievement from receiving their Challenge certificates. To promote this, the libraries have also held author visits (Christopher Brookmyre and Janice Galloway to name a couple). As you can imagine, this totally confounded my narrow preconceptions of what a health librarian did, and goes to illustrate the importance of the library service to the whole hospital community. This was perhaps the part of the visit which I found most enjoyable and useful as we got to hear the views of librarians from different sectors, all at different stages in their career. Government, health, public, academic, music and college libraries were all represented and on the tweet-up were library assistants, job hunters and those in their first professional post, as well as library managers, subject librarians, retired (but very active!) professionals and even the Director of CILIPS! We all had a good natter about “how far is too far?” This seemed particularly relevant as we had just been talking about the classes which Shona and her staff run to help people to be more self-sufficient in their reading, writing, numeracy and IT skills. A few librarians from the academic sector spoke about their experiences with students expecting library staff to do their full literature searches for them. This led back to our discussion on librarians as teachers and the important fact that we are there to teach people information seeking skills and to provide them with the resources they need in order to help themselves, not to do their work for them. This is certainly a golden rule which I endeavour to adhere to in my own working practice. The next stop on our tour was the library at the Beatson, the West of Scotland’s specialist cancer care centre. This library is closed to the public and is for academic and research purposes. The texts available are obviously mainly concerned with the treatment of cancer in its various forms, and doctors at the Beatson carry out important research in this area. 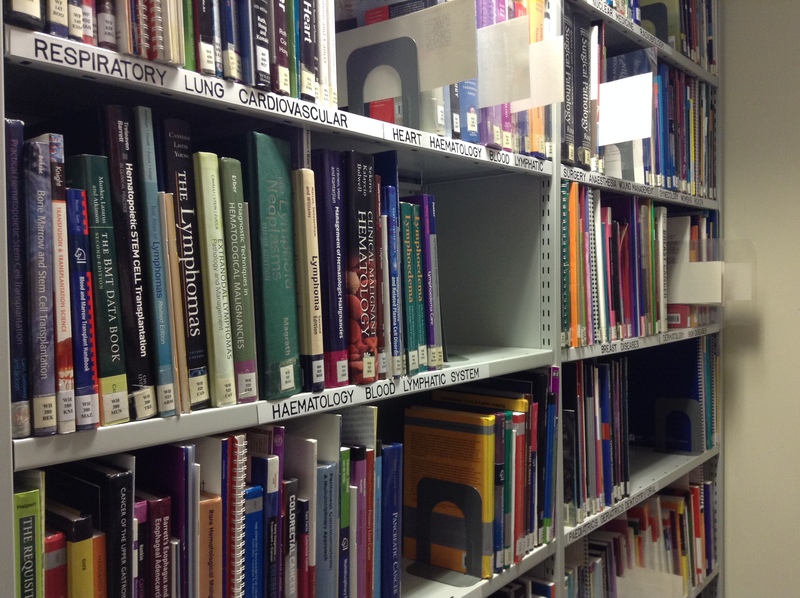 The librarians here are therefore specialists in this subject area, and the work they do greatly contributes to patient care. At this stage in the visit, we collected some leaflets about the various online information services provided to NHSGGC staff. These are all collated under a single online interface called QUEST and include document delivery, ILLs, current awareness services and literature searches. Part of these services is the ‘Tools and Measures’ service. I found it interesting to learn that diagnostic tools and frameworks may be copyrighted, and this service investigates whether a tool is under copyright or not so that medical professionals may use it, or purchase a licence if necessary. After the Beatson, we visited the Public Health Resource Unit which is also based on the Gartnavel campus. This is the NHSGGC’s information service for all matters related to public health, from smoking cessation campaigns to what would happen in the case of a citywide swine flu epidemic! Staff liaise with emergency services and provide a free batch ordering service for public health related leaflets, such as those found in your local GP’s surgery. It was very interesting to hear about an information service which plays a part in all of our lives even though we may not be aware of it, and it made me wonder how many other unsung information heroes there are across the nation? The final stop on our tour was the library at Gartnavel Royal Hospital, a mental health hospital which provides inpatient care for the west side of Glasgow. The library is open to all staff but has a more academic library feel than that of Gartnavel General. 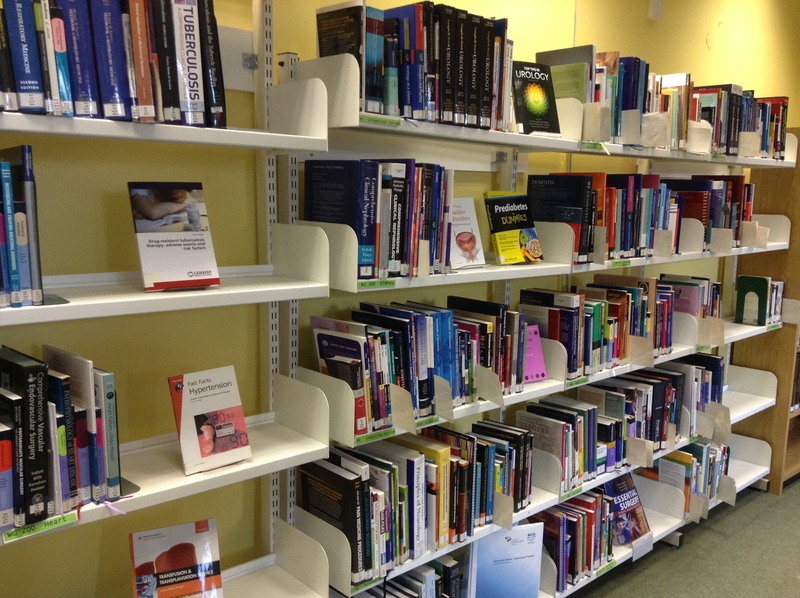 The vast majority of the resources available deal with the subject of mental health and, once again, library staff become like academic subject librarians as over time they build up specialist knowledge in this area. Some library staff are currently undertaking a digital preservation project, to safeguard the hospital’s historical collections for future generations. Once again, this kind of activity is not something I had imagined to be part of the role of a health librarian. At the end of the visit, I think it is safe to say that all of us on the tour were impressed by the variety of tasks which make up the job of a health librarian. Indeed, Shona and her staff seem to be fulfilling the role of public and academic librarian at the same time, not to mention the role of subject and special collections librarian witnessed in the three smaller information services. Their depth of knowledge, experience and unrelenting passion for their work is inspirational to see, as is their resilience to the changes currently taking place at NHSGCC (the Western Infirmary transferred to the new South Glasgow hospitals at the end of May 2015). From a personal point of view, I was encouraged to learn that, although some of our skill sets may vary, the values which underpin the work of a health librarian and a public librarian are really no different. Sector aside, every librarian there has a heart for seeing their service users gain access to the information, skills and resources they need to flourish and to help others flourish in their turn. I believe that libraries are places of healing, just as hospitals are, and thanks to Shona McQuistan, her staff and my fellow Glasgow Library Tweeters, this particular librarian is feeling encouraged to continue prescribing books and other online resources to her ‘patients’ for the foreseeable future. Thanks to Christine for that comprehensive and entertaining account. An added bonus of the visit was strolling between libraries and viewing Gartnavel’s grounds – and, for four of us, a delicious meal afterwards at Sisters’ Restaurant in Jordanhill. Ideas for #GLTU16 welcome! I’m happy to tell you that #GLTU15 has now been fixed for the afternoon of Tuesday, 28th April at 2pm. We’ll be visiting the libraries at Gartnavel: the General and Royal Hospitals, the Beatson and the Public Health Resource Unit. I had a preview before Christmas, so pop over to the post I wrote then for more pictures – it was a fabulous afternoon and I learned a lot about the variety of work in health librarianship. Many thanks to Shona McQuistan for all her work organising this. Getting to Gartnavel is easy – it’s well served by buses on Great Western Road (there’s a stop just next to the hospital) or by Hyndland Station (via the footbridge – turn right on the bridge then left at the bottom of the steps.) I don’t recommend driving – the carpark is always full, though there is the option of paying to park at the nearby Pond Hotel. We’ll meet just before 2pm at WH Smith’s at the main entrance to Gartnavel General. There’s a fair amount of walking between buildings, so dress for the weather – if it’s nice, we can enjoy the grounds. If it’s not, we’ll run! The visit will finish by 5pm, after which there is the option of a traditional GLTU curry. Indian Platform is just across the road and opens, conveniently, at 5. How to book? Numbers are limited to 10 so I haven’t bothered with an Eventbrite page. Contact me by leaving a comment below, tweeting @AnabelMarsh or emailing anabelmarshATgooglemailDOTcom. Make sure to tell me whether you are booking for the visit, the curry or both. I look forward to seeing you there. Seven Glasgow library tweeps met up for curry and a chat last week, at Charcoals on Renfield Street. I meant to take lots of pictures of the food, but I’m afraid we descended on it like a plague of locusts and it was all gone before I remembered. So not a great deal to say about #GLTU14 except that it was good food and good company! Looking ahead, you might remember that before Christmas I mentioned a possible visit to the libraries at Gartnavel (see this post for details). I now have a provisional date – Tuesday, 28th April. Put it in your diary now, and confirmation and more details will follow. Following yesterday’s announcement that the Scottish Government is scrapping plans for a £75 million prison, I thought I’d return to a draft blog from #GLTU’s visit to Cornton Vale’s prison library, which I initially started in June 2014. Eight months later, my notes serve as a reminder not just of the day itself, but of the remarkable women we met working in Education and Outreach services at Stirling Council whose ‘back-to-basics’ approach places both education and libraries at the centre of prisoner reform. #GLTU13’s visit to Cornton Vale women’s prison was a timely occurrence following the recent controversy over MP Chris Grayling’s decision to ban book donation to prison libraries. [A decision declared unlawful in December, 2014]. It was with this in mind that a group of librarians travelled to the outskirts of Stirling, flanked by the Trossachs and the Wallace Monument, to meet Liz Moffat, Outreach Librarian at Stirling Libraries and Carol, who helps to deliver that outreach. Filing through security, and following a prison officer across the grounds, we were greeted by Kaye Stewart, Learning Centre Manager, who described the work being done at the prison around learning and literacy. Kaye’s sincerity about the education of the women she works with at the prison was, for me, one of the most memorable aspects of the visit. She spoke candidly about the learning projects being run at the prison while showing us around the space. She stopped to describe the importance of a recently opened kitchen space designed to teach inmates life-work skills, the ‘Create and Curate’ art project (where inmates were led by artist Brigid Collins), and how the work of reading groups such as Carol’s embodied the impact that reading has for the women who attend. One woman, for example, disclosed to Liz that she had just finished reading her first book having learnt how to read at Cornton Vale. In the Library, we learned about New College Lanarkshire’s contract to deliver education through a librarian in Shotts Prison rather than, as is the case at Cornton Vale, the prison library being staffed by inmates. Kaye described how the new Grampian women’s prison, and those at Greenock and Edinburgh, have led to fewer inmates at Cornton Vale, now earmarked for closure. With budgets for prison education programmes tightening, Liz explained how it was necessary for Stirling Libraries to negotiate a new service level agreement to supply outreach services for harder-to-reach library users. This allocation of prison funds emerged as a recurrent theme as we listened to how the library is used both as a space for relaxation by the inmates and a site for peer-tutoring and emotional support. Kaye suggested that having a librarian in post at the prison could be considered a drop-in-the bucket in comparison to the overall cost of running a prison. The case for prison libraries being put back on the agenda has arguably been made by successful reading initiatives such as book groups and a Reader-in-Residence project (run for a year at Cornton Vale as well as at Perth and Polmont prison libraries, while HMP Perth continues to fund half a librarian’s post). But the impression conveyed was that more is needed to assist prisoners’ rehabilitation, particularly given the grave social circumstances from which some arrive at the prison and return to after serving short-term sentences. The group was keen to ask questions about prison library censorship. Liz explained how she adheres to the CILIP rule when selecting library stock: “if it’s in stock, then you can’t censor it.” Nonetheless, ‘True Crime’ was conspicuous in its absence on the well-stocked shelves, although the intention is to protect inmates and newspaper and magazine subscriptions do exist. The ruckus around the UK government’s decision inevitably came to the fore when Liz highlighted the view that the library service (as opposed to donations) should be able to provide additional requests for reading material. The requests Liz receives, like those made in public libraries on any given day, ranged from dream interpretations to baby names to the latest Martina Cole or Patricia Cornwell novel. A preference for female authors in an all-female prison might not have come as a huge surprise although we did also hear about a particularly rambunctious book reading by Alan Bissett in the prison chaplaincy that nearly resulted in the Falkirk author being thrown out of prison. Of further interest was a discussion around the lack of Internet in prison libraries. Could a list of approved websites not be supplied to give inmates access to online content without compromising prison security? ‘Yes’ was the answer from Kaye, but this idea had been snuffed out by the Scottish Prison Service based on expense. Instead, inmates obtain limited access to digital resources through the prison’s intranet. From a digital participation view-point, this use of ‘white sites’ (Americanised ‘safe sites’) for educational use, appeared to loom large. With only limited knowledge of how Stirling Libraries are delivering its outreach to vulnerable groups, I had no fixed idea of what to expect from the visit. What I went away with, however, was a fresh perspective of the importance of freely-accessible education for the women at Cornton Vale. I admit to being surprised at the tranquillity of the library and the availability of stock, something for which Liz should be given credit. On the way back to the station, she stressed the importance she places on this as part of her outreach responsibilities. I was struck by Carol’s filial comments about wasted talent and her curiosity to know what becomes of the women once they resume their lives. While working in a number of Glasgow’s community libraries over the past few weeks, questions raised by the visit have stayed with me. 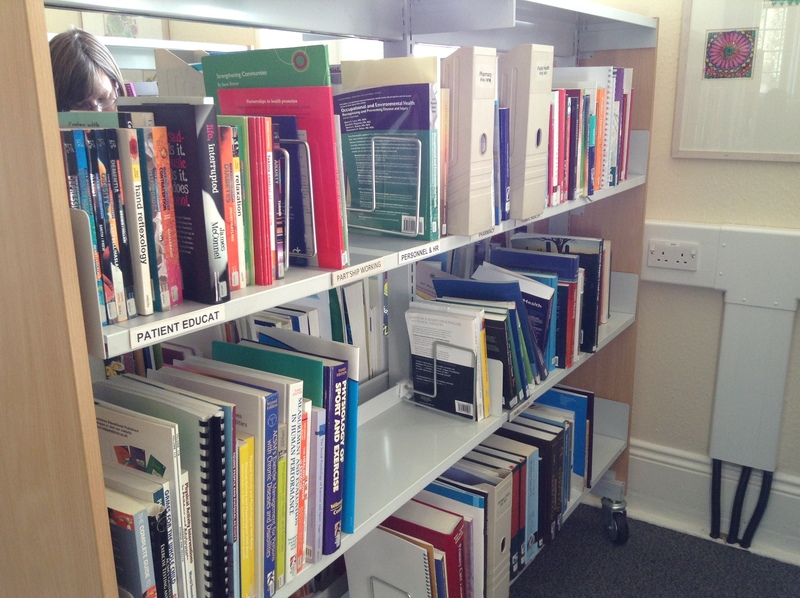 How, for example, do public libraries assist in the reintegration of ex-offenders back into society? Although they occasionally appear on the target-user groups within library service development plans, what work is being done to achieve this goal? Just as importantly, is it something that public library staff should be trained to assist with? The relationships with reading being built in prison libraries, exemplified through Cornton Vale’s partnership with Stirling Libraries and Kaye and Carol’s rehabilitation work, might not just encourage ex-offenders to continue a positive relationship with reading on their release, but may also elicit answers to these questions. 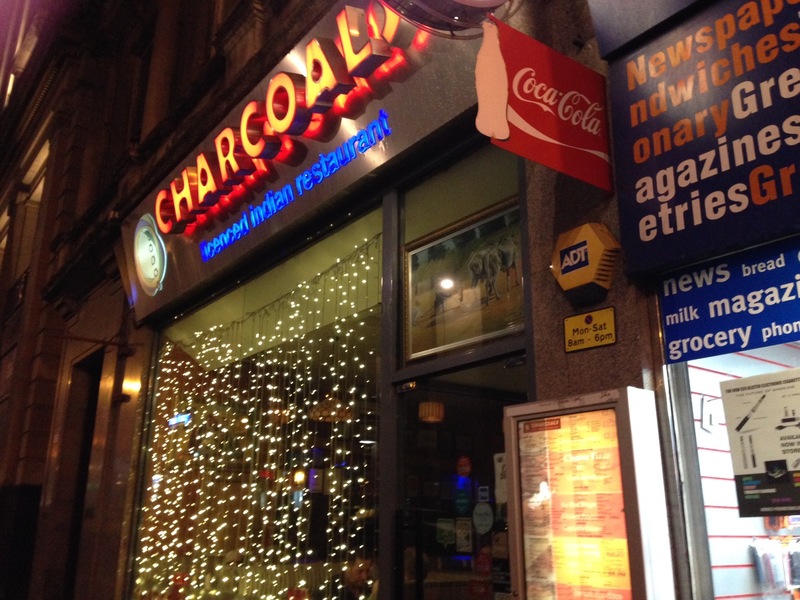 A table has been booked at Charcoals on Renfield Street for 6pm on Thursday, February 5th. Six of us have signed up already – care to join us for a curry and a chat? If so, please let me know asap by commenting below or tweeting @AnabelMarsh. The pictures above are from our last visit to Charcoals (#GLTU11) and, I hope, will whet your appetite! Gartnavel Hospital – a future #GLTU? Last week, I went to the Gartnavel Hospitals Campus on a reconnaissance for a future GLTU. I had a great tour and am grateful to Shona McQuistan, Librarian at Gartnavel General, for showing me round. As well as Shona, I met several other, equally enthusiastic, librarians and learned about services at the General, Gartnavel Royal, the Beatson and the Public Health Resource Unit. We also popped in to the beautiful Maggie’s Centre. Below are a few pictures (taken on an iPad so not very great) to whet your appetite for a future visit. They show the Library at Gartnavel General, an embroidery of Glasgow School of Art based on a painting by Avril Paton, a poster for the 21st birthday celebrations of the Library at the Royal (this was the day I was visiting, so there was cake), a sheaf catalogue on display as a historic artefact (sad to say, I have worked with those) and mirrored tree stumps in the Maggie’s Centre Garden. There’s quite a lot of walking between buildings (the grounds are worth seeing too) and the wind blew and the rain rained, so this is probably an event for the Spring when we have a better chance of good weather. It’s likely to be a Tuesday or Wednesday afternoon followed by the traditional GLTU curry – there just happens to be an Indian restaurant across the road. Watch this space! In this guest post, Jane Furness of Edinburgh College of Art writes about her session on information literacy and the ideas that came out of it. In this lovely tweet, a book about shoes is surrounded by – shoes! Offer 15 minute library training sessions – not hour-long ones! DO INFORMATION LITERACY BY STEALTH!